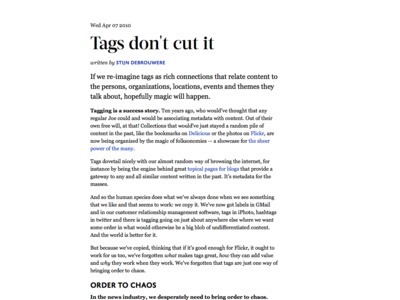 "We need to re-engineer tags so that they’ll allow us to represent the rich relationships between our content and the things that content talks about. If we do that, newspapers can infuse the news with necessary context that allows readers to see the broader picture. Quite literally, too: relationship-infused content can easily be enriched with maps and timelines, which goes way beyond what tags have to offer. Tags have a deceiving simplicity that hides their complexity as a taxonomic concept. Relationships are closer to the way journalists think about their writing. Relationships are a direct answer to the question “what is this story about?” Because they’re more intuitive than tags, they’re actually harder to mess up. If we re-imagine tags as rich connections that relate content to the persons, organizations, locations, events and themes they talk about, hopefully magic will happen."